So you tested your food safety habits in last Thursday’s quiz, and I’m guessing that since you’re reading this article, it means that you didn’t score so well! It’s no big deal. The purpose of this post is to explain why it is important to adopt safe food practices and how you can do it. 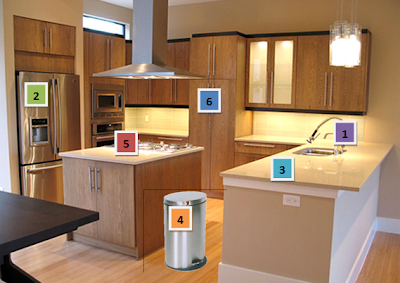 We will take a tour around your kitchen and give you tips on how to avoid possible contamination. Food can provide ideal conditions for bacteria to multiply and produce toxins. In fact, three conditions are necessary for disease-causing bacteria to thrive: nutrients, water or moisture and warmth (temperature between 4 and 60°C). 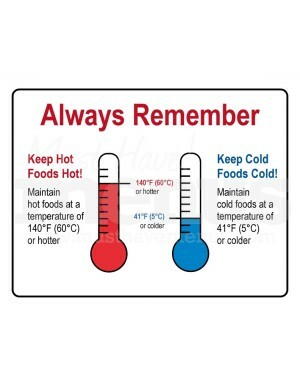 Good food handling and storage is crucial to prevent foodborne illnesses or in other terms food poisoning. The truth is, any food or beverage contaminated with a bacteria, parasite or virus can generate symptoms that range from an upset stomach to more serious symptoms, including vomiting, diarrhea, abdominal cramps and dehydration. The most vulnerable to foodborne illnesses are pregnant women, newborns, infants and toddlers, older adults and people with a weakened immune system (cancer patients, AIDS, etc.). Some people think that these illnesses are very rare; however, 1 in every 6 Americans gets sick from food poisoning every year. This problem is more serious than many people realize. 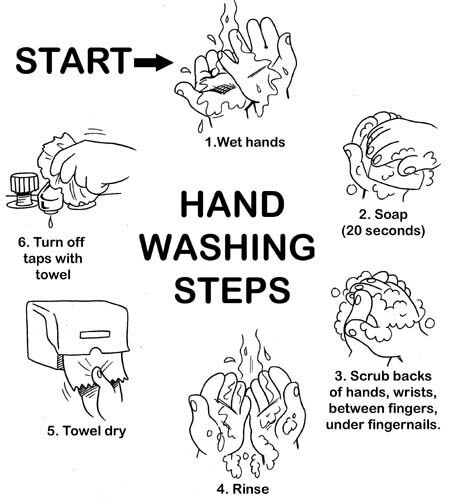 Yet, very simple steps can help prevent it and keep the entire family safe! Let's take a tour around your kitchen. 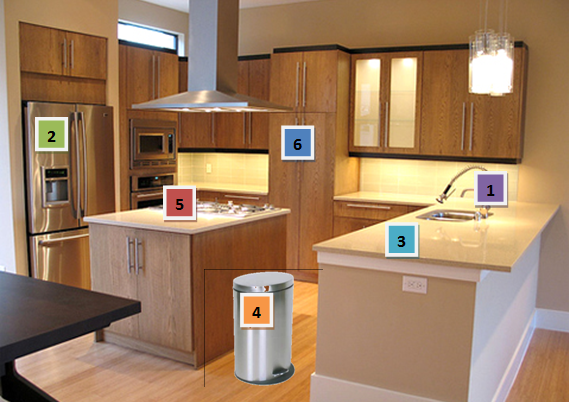 Each number and color corresponds to a specific area in your kitchen. We will reveal the tips regarding each one during this week. 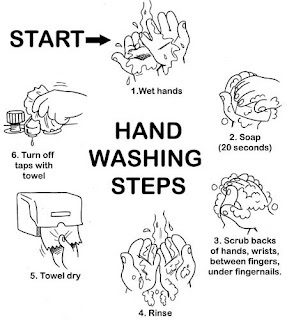 There’s also a specific way for washing your hands. Check image to the right. Clean utensils by putting them in a dishwasher or using soap and hot water. Wash surfaces and cutting boards after each use by flooding the surface with bleach and letting it stand for 10 minutes then rinsing with clean water. Air-dry them or use fresh paper towels. Use a microwave to kill microbes on sponges. Place a WET sponge in the microwave oven and heat it. Dry sponges may catch on fire!! Even if you plan to peel fruits and vegetables, it is important you wash them first because bacteria can spread from the outside to the inside as you cut or peel them. Also, use a disinfectant rather than just soap. Washing raw meat and poultry can actually help spread bacteria because their juices may splash onto your sink and countertop. All commercial eggs are washed. Any extra handling of the eggs can increase risk of cross contamination especially if the shell is cracked. The fridge temperature should be between 0 and 4°C. The freezer’s temperature should be below 0. Cold air must be allowed to circulate freely in your fridge. 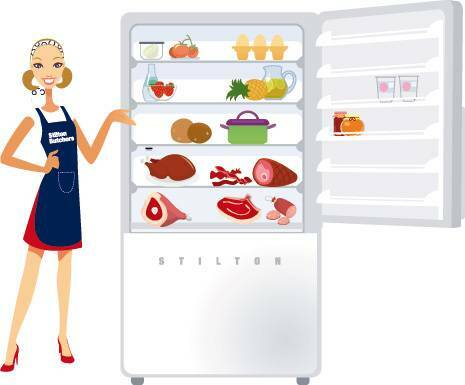 c. Get perishable food in the fridge or freezer within 2 hours and in summer within 1 hour. By dividing leftovers into several, clean, shallow containers, you’ll allow them to chill faster. - Keep them separate from all other foods in the fridge: They should be placed in containers or sealed plastic bags in the bottom shelf of the fridge in order to prevent their juices from leaking onto other foods. - Store meat in the coldest part of the refrigerator or in the refrigerator's meat bin. - Use fresh, raw meat stored in the refrigerator within three to four days of purchase. - Throw away ground meat, sausage and organ meat after two days. - Store them in their original packaging in the coldest part of the fridge: Do not use the pre-made egg cups in door where eggs are susceptible to warmer air from the door opening and closing. - Hard boiled eggs can last a week in the refrigerator, in or out of the shell. - Never store milk in the refrigerator door where it is susceptible to warmer air from the door opening and closing. - Tightly wrap cheese and place back in the refrigerator after opening. - Remove mold from hard cheese by cutting a one-inch square around it; the rest is safe to eat. - Discard entire package of soft or shredded cheese if mold is present. - Cold water: submerge frozen package and change water every 30 minutes. If you’re using this technique, you must cook food immediately. - Microwave: also cook immediately. You can also cook food without thawing. It is safer but it will take 50% more time to prepare. Marinate meat in a covered dish in the refrigerator. Do not re-freeze thawed meat! Any food with an “off” appearance or odor should be thrown away, of course, and not even tasted. However, you cannot rely on your sense of smell, taste, and sight to warn you because most hazards are not detectable by odor, taste or appearance. As the old saying goes “when in doubt, throw it out”. You can also check the Safe Storage Times Chart. - Discard all milk after the container has been opened one week, regardless of the "sell-by" date. - Use yogurt within seven to 10 days after buying it. - Ice cream can last for two to four months. - Hard cheese, like cheddar, Gouda, Edam and Swiss, can last for three to four weeks. It is okay to freeze hard cheese, but texture and taste may suffer. Cottage cheese: 10 to 30 days. After opening, processed cheese spread lasts for three to four weeks. Color and texture of food are not sufficient indicators of whether a food is done and the bacteria killed. A thermometer is needed to check if you have reached the right temperature which is above 60°C. The possibility of bacterial growth increases as food cools after cooking. Use a warming tray in order to keep your food above 60°C. - Heat your food till it reached around 75°C. - When you microwave your food, you notice that a part of the dish is very hot whereas the other part is cold. That’s why you should stir your food in the middle of heating. - Let the food rest for a couple of minutes if stated on the label. It could be a crucial moment to prevent disease. - Whether you’re boiling, frying or scrambling eggs, make sure the yolks and whites are firm and not runny. - Never eat raw eggs such as in cookie dough or cake batter. - When a recipe calls for raw eggs such as Caesar salad dressing, use a liquid pasteurized egg substitute instead. Use one cutting board for fresh produce and another one for raw meat, poultry or seafood. And when it becomes excessively worn or develops hard-to-clean grooves, considering replacing it. Whether in the shopping cart or plastic bags, separate raw meat, poultry, sea food and eggs from other fresh foods to keep their juices from dripping on those foods. When the food is cooked, the bacteria is killed. However, if you place it back in the previous container, it can be contaminated. The entire Lebanese population has become more aware of food safety nowadays. Health professionals, the government and even TV shows are dealing with this issue. However, everyone seems to forget about the food safety in our own houses and more particularly in our own kitchens. So let’s start there and I’m sure we can decrease a large number of food poisoning incidents. this is really good! 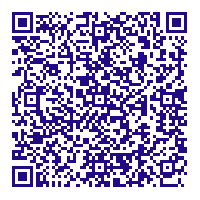 u can turn this post into a manual u know :D seriously good info! Are you safe in your own kitchen?